Werner Herzog knows when he's found the right subject for a film. But don't ask him to explain; he just knows, that's all. And he instantly knew he was destined to make his new documentary, Grizzly Man. It combines video footage shot by deceased grizzly-bear advocate Timothy Treadwell with recent interviews of his acquaintances and Herzog's own often-contentious commentary about his subject. It is tentatively scheduled for an August theatrical release via Lions Gate Films, followed by an airing on the Discovery Channel in fall 2006. Treadwell, a charismatic figure for his blond good looks and Malibu surfer-boy image, desired to live near the bears in Alaskan wilderness and study them. He spent 12 summers doing so, producing a book and a television special (The Grizzly Diaries ) and making personal appearances. He became a celebrity champion for endangered grizzlies, even appearing on Late Night with David Letterman. "It's very strange," Herzog says, while sitting on a hotel lounge couch at Park City, Utah. "There are moments, and it's happened quite a few times in my life, where there was complete illumination." His film was premiered at this year's Sundance Film Festival in the World Documentary Competition; it won the prestigious $20,000 Alfred P. Sloan Prize for outstanding film about science and technology. "This was one of those times," he continues. "I saw everything clearly and knew this was it. It's nothing emotional, but nothing cerebral, either. I jumped into this project without having seen any of the footage. And I was not wrong. It is my profession, and if I did not have these moments of clairvoyance, I would not be a filmmaker." And yet, to borrow an observation once made by Deadwood television writer/producer David Milch, "Visions come to prepared spirits." The 63-year-old Munich-born Herzog, who now lives in Los Angeles, has made a distinguished--some would say "hallowed"--career out of chronicling the lives of outsiders. Some of his subjects have challenges and adversity thrown at them--by mankind or nature, both of which are capable of causing horror and pain equally--and some seek it out. His dramatic films, including Aguirre: The Wrath of God (1972), Fitzcarraldo (1982) and Nosferatu (1979), feature characters not only at odds with the world around them, but also at war with themselves. Among Herzog's documentaries are Land of Silence and Darkness (1971), about an elderly woman deaf and blind since her teen years; Herdsmen of the Sun (1989), about a tribe inhabiting the Sahara Desert; and Little Dieter Needs to Fly (1997), about a Vietnam War POW struggling to survive. Often Herzog tests his own stamina making these films in remote locations; the scary process of creating Fitzcarraldo was revealed in Les Blank's 1983 documentary Burden of Dreams. Because of that history, executive producer Erik Nelson approached Herzog about taking on Grizzly Man. "Treadwell struck me as a Werner Herzog kind of guy," Nelson says during a telephone interview. "An artistic lunatic battling artistic demons and a heart of darkness." Nelson had helped arrange financing for another upcoming Herzog documentary, The White Diamond (about exploration of the Guyana rainforest via airship), and was working on a Discovery Channel special, Anatomy of Bear Bite. Jewel Palovak, Treadwell's partner in the organization Grizzly People, had given Discovery rights to use his footage. She is an executive producer of Grizzly Man and is featured in the film. From the footage in Grizzly Man, there certainly beats a heart of weirdness inside Treadwell. Among the footage in the film is an angry, expletive-ridden monologue to the camera about the National Park Service. And at one point, Treadwell bizarrely rhapsodizes about touching the feces of a bear named Wendy. "It was inside her; it's her life," he marvels. From his own narration, it's clear Herzog doesn't agree with Treadwell on a key point: the intrinsic oneness between mankind and wild animals. "I see only the overwhelming indifference of nature," he says in the film. Yet, in our interview as well as in the film, Herzog is also careful to give Treadwell his due--as a filmmaker with a keen eye and as a passionate advocate for his cause, not afraid to live what he believes. Grizzly Man is conceived as a friendly, somewhat rueful argument between Treadwell and Herzog. "This film does not deny that Timothy Treadwell had something glorious about him, a wonderful performer who had his ecstasies and his exhilarations," Herzog says. "And at the same time, there was a dark side--very strange, dangerous, disturbed and struggling with demons. There are sides where you see he's clearly off track of something." Herzog received the go-ahead from Discovery to start work in September 2004 and was finished in time to submit the film to this year's Sundance Film Festival. He worked at a breathtakingly fast pace. With the assistance of four editors, Herzog began going through the raw footage, looking for material--especially direct-to-camera addresses--that revealed Treadwell's personality. "A majority of what he left was of grizzlies fishing for salmon, bear cubs fluffy and cuddly with their mom," Herzog says, with a slight laugh. 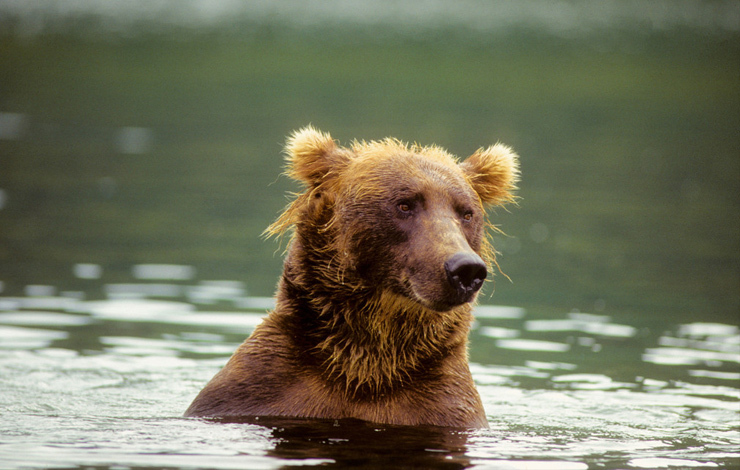 "I knew there was maybe 50 hours of just looking at bears, seeing them in a river or catching salmon, which would have constituted a very fine nature film. But my film is not a nature film. It's a film of human nature." Herzog's key artistic decision in Grizzly Man is to not play on screen the surviving audiotape of the fatal attack. (There is no video footage.) He listens to it on-camera, admonishing a shaken Palovak that she must never listen to it, and also at another point has a coroner describe what he heard. Herzog defends this decision rigorously. "We are not into snuff movies," he argues. "There is a borderline of discretion and a responsibility to Timothy and Amie and to the parents of both. Just imagine they're at home watching the film and hear both of them scream for their lives. If you come across material like this you have to view it to find out what is it, but the decision [not to air it] doesn't take more than two seconds." In the film, Herzog says he believes the common denominators of the universe are chaos, hostility and murder. He stands by that in our interview. "I have the impression by simple observations that there is no harmony in Mother Nature, and I don't like this romanticized New Age approach. I cannot take it any longer," he asserts. "It doesn't matter how the universe is organized," he continues. "Since we are here and we are part of the creation, as faulty as it can be, we have to give meaning to this planet." Steven Rosen is a Los Angeles-based freelance arts and entertainment writer, whose stories have appeared in the Los Angeles Times, The Denver Post and on IndieWire.com. He can be reached at srosenone@aol.com.